The Japanese Alps contain some of the best skiing in Asia, with several of the best resorts located in Hakuba Valley. With an annual snow fall of 11 meters and a nearly endless number of runs, Hakuba is quickly becoming a global ski destination. In fact, the valley will reach 200,000 foreign stays this year. But if you’re not skiing, you don’t need to be sitting in your room! Besides epic ski runs, there are a wealth of cultural experiences to be had and things to do around Hakuba. The following are some of the great ways to experience Japan while on your Hakuba vacation. You can also check out 10 Essential Tips to Plan Your Japan Ski Trip for more helpful advice before you arrive; and if you’re considering including the northern resort town of Niseko, then take a look at the Best Things to Do in Niseko Off the Slopes! With tired legs after a long day on the slopes, the best way to recharge is to visit one of the many onsens in Hakuba Valley. Even if not skiing at all, relaxing in the hot springs is an excellent way to pass a winter’s day! Each onsen has its own qualities, such as different colors and minerals in the water and their various healing qualities. Each building is different too, from small wooden shacks to multi-leveled concrete buildings. Be aware that it’s customary to bathe in the onsen completely naked. It may feel daunting to walk into a public onsen at first but the experience is well worth any initial awkwardness! Check out a list of Hakuba’s hot springs here. Enjoying the steaming heat in the middle of the falling snow is one of the most memorable experiences. Check out some of our favorite Towns to Enjoy the Winter Snow in Japan. The only monkeys known to bathe in hot springs stormed onto the world stage in 1970 after the park was profiled on the cover of Life Magazine. Since then, their popularity has only continued to grow around the world. You can see these most relaxed of animals at Jigokudani Park. Entrance to the park costs ¥800 (about $7), opens daily from 9am to 4pm, and it makes a great day trip from Hakuba via public transport (see on Google Maps). Insider Tip: Visitors must walk 25-40 minutes through a beautiful wintery park before arriving at the monkey viewing area. Dress appropriately, and enjoy a stroll through the woods! There are three legs in the journey from Hakuba via Nagano Station. 1. First head to Nagano Station which takes about 1 hour. 2. Take the express train from Nagano Station to Yudanka Station. The trip takes 50 minutes and costs ¥1,160 ($10). Nagano Station is about 2 hours from downtown Tokyo via bullet train. 3. Take a 10 minute bus ride to Jigokudani Park. The station staff will be able to assist you in purchasing a ticket. One of Japan’s most important historical sites, Matsumoto Castle is one of the oldest standing castles in the country. Nicknamed The Crow Castle for its unique black color, Matsumoto differs from most Japanese castles in that it was built on an open plain. Visitors can enter the beautifully preserved castle for ¥610 ($5.50) and climb to the highest level for amazing views of the area. There lots of traditional shops and restaurants near the castle grounds as well. The castle is just 80 minutes from Hakuba on the JR Chuo Line (see on Google Maps). If you are enamored with Japanese castles, and why wouldn’t you be, check out another fine example: Himeji Castle. Built in the 7th century, this is a must see for every Hakuba visitor given its accessibility, significance, and beauty. 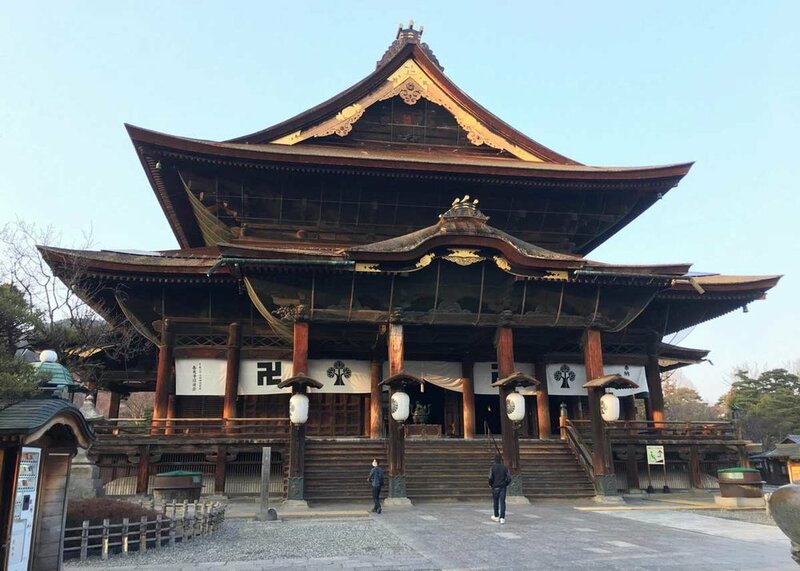 The temple stores what many believe to be the first ever Buddhist statue brought to Japan. Situated 10 minutes from Nagano Station, itself a 70 minute train from Hakuba, Zenkoji Temple is the perfect pit stop for travelers coming to or leaving Hakuba. A traditional style street adorned with beautiful black lamps and lined with cafes, souvenir shops, and restaurants paves the way to the Zenkoji Temple from Nagano Station (see on Google Maps). For the history buffs among you, check out these 7 Best Places to Experience Ancient Japan. The town of Omachi near Hakuba, has some great museums to get to grips with local culture. Visitors can explore the Edo era salt trade, Edo architecture, and kimono and yukata culture at the Chojiya Museum in Omachi, a 45 minute train ride away from Hakuba. Built in 1890, this beautifully preserved museum was once a salt wholesale house, and visitors can see traditional Japanese facilities such as the open irori fireplace, doma earthen floor, and a tatami-clad drawing room. And of course, it has a Japanese style warehouse used for storing salt. At the nearby Omachi Mountain Museum, you can also explore the history of life in the mountains, which offers a fascinating glimpse of local culture in quieter times! One of the best things to do in Hakuba besides skiing is to learn about the 1,400 year old Taiko Drum culture from the professional Otari Daiko Performers. Otari is the village next to Hakuba, where a local team demonstrate the ancient art. If you join a tour you will also have a chance to play the drums with the instructors. It could be a great option when you have a day off from the ski slopes. Want to learn about Japanese traditional tea ceremony while donning a kimono? Then why not try to learn the art of making real Japanese tea and enjoy it with a group of friends in a very cultural Japanese tea ceremony style. You will sit on traditional tatami floors and feel every bit of traditional Japan. Hakuba is located deep in the mountains (take a look on Google Maps), so the best way to get there is probably by train. The bullet train from Tokyo to Nagano takes about 90 minutes. Then you’ll need to change to a local train to Hakuba station for a further 70 minutes. Do you have any suggestions of things to do in and around Hakuba? Let us know in the comments below! John Blagys is an American ex-pat who loves cycle touring, Japanese baseball, and living in the mountains. He manages Hakuba.com, the one stop shop for all your Hakuba information.